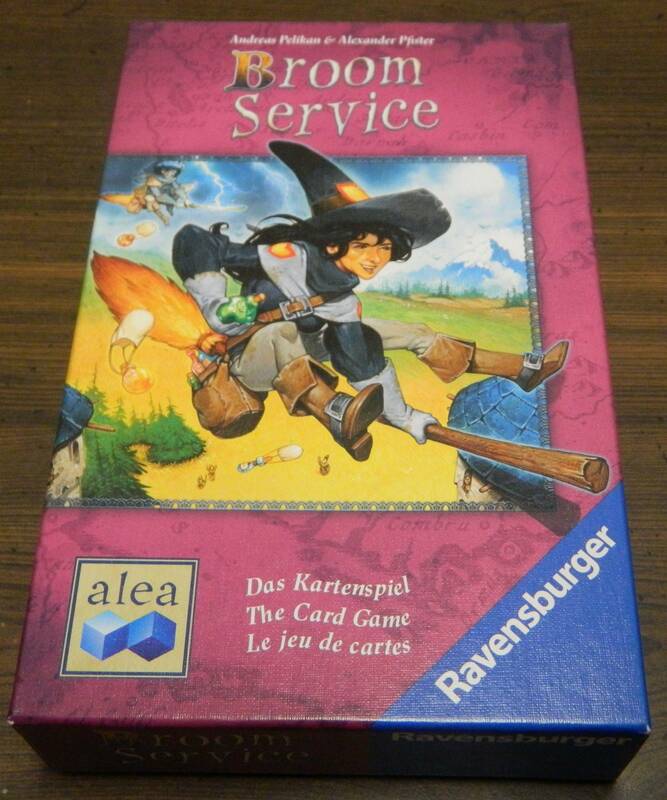 Released in 2015 the original Broom Service was a highly acclaimed game which eventually won the Kennerspiel des Jahres award. Like a lot of other recent popular board games this lead to a card game being designed based on the board game which was 2016’s Broom Service The Card Game. I have to admit that while I have been interested in trying out Broom Service I have yet to play it. Therefore I didn’t really know what to expect out of the card game. Broom Service The Card Game is a solid quick card game but it fails to be anything more than a very average card game. Sort the task cards based on the number of players. Randomly choose three task cards that match the number of players in the game and place them face up on the table. The rest of the cards are turned face down and placed next to the face up task cards. 3 players: Remove the 20, 21 and 22 cards from the game. 4 players: Remove the 21 and 22 cards from the game. 5 players: Remove the 22 cards from the game. The rest of the witch cards form the draw pile. One card for each player is placed face up on the table. The oldest player chooses one card. Moving clockwise each player will choose one card. These cards are placed in the “cowardly” position. The oldest player will start the first round. The game has been set up for four players. Each player will get to choose one of the four cards on the bottom. The game is played over four rounds. Each round will consist of three to nine turns. To begin the round each player chooses three different witches from their hand. The players place the rest of their cards to the side to be used in a future round. The starting player then plays one of their witch cards face up on the table. They have to choose whether they want to play the card “brave” or “coward”. 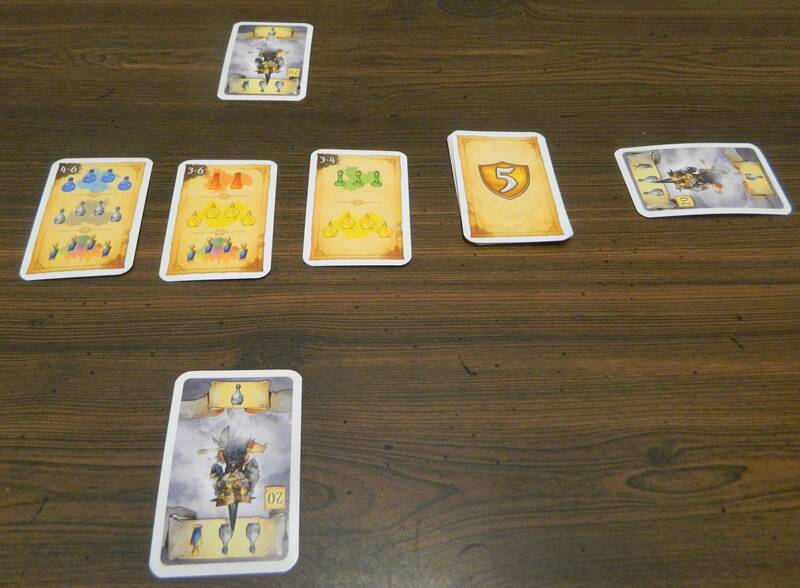 To play the card brave, they place the three potions side of the card towards the center of the table. By playing a card brave the player can earn more but is taking a risk. This player has played their card brave. To play the card coward, they place the card with the one potion side of the card towards the center of the table. By playing a card coward the player can’t earn as much but also takes no risk. This card has been played coward. Going clockwise each player then has an opportunity to play a card. If the player has a witch card in their hand that matches the card already played, the player has to play the card. They can choose to play the card brave or coward. 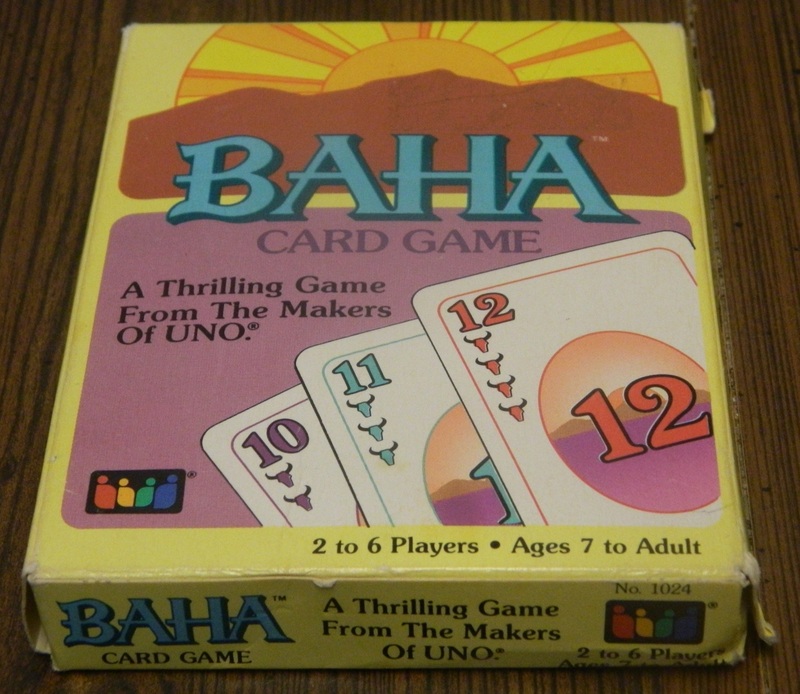 If the player plays the card brave and one of the previously played cards were also played brave, the previously played brave card is flipped over and will score no points. If a player does not have a card that matches the card that was played, they don’t play a card. Once everyone has had a chance to play a card, the turn ends. The player who played the last card brave will start the next turn. If all of the players played their witch cowardly, the player who played the first witch cowardly will start the next turn. If a player is supposed to start a turn but they have no cards remaining, the next player clockwise starts the next turn. The bottom player started this turn. They played their card coward. The next player didn’t choose a card of the color so they didn’t play a card. The top player played their card brave. The right player also played their card brave. The top player flips their card over. The player on the right will start the next turn. Once all of the cards have been played the round ends. Players sort the cards they played during the round based on witch/color making sure to keep the cards facing the direction that they were played in. Players then look at the task cards in the middle of the table. If a player meets the conditions for one or more of the cards they will get to take the card which will be worth five points at the end of the game. If multiple players complete the same task card at the same time, one player takes the card and the other players take one of the face down task cards which are worth the same number of points. Once a task card is removed, players can no longer earn the victory points from it. No additional task cards are put out for the rest of the game. 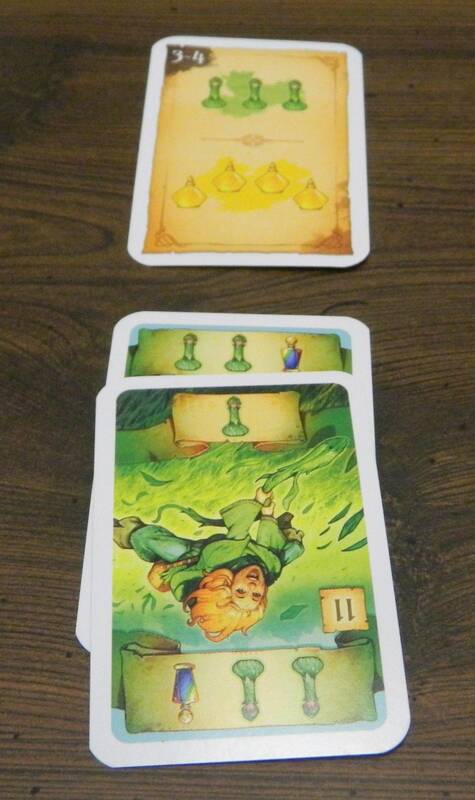 For this task card the players had to either collect three green or four yellow potions. Since this player has collected three green potions they will collect the task card. All cards that were flipped upside down are returned to a player’s hand. Each player is then dealt three more cards. Players will choose three cards from their hand for the next round. The player who “won” the last turn of the previous round gets to start the next round. Each player will also score five points for each task card they earned during the game. 5 points for the task card. This player has scored a total of 23 points. The player with the most victory points wins the game. If there is a tie the player with the least number of witch cards wins the game. If it is still a tie, the tied players share the victory. If I had to break down Broom Service The Card Game I would say that it is kind of a blend between a press your luck and read the other players game. The goal of Broom Service The Card Game is to score the most points. Since all of the players will play the same number of cards, to improve your chances of winning you need to choose the right times to play a card brave and try to play as many cards of the same colors as possible. Your success in both of these aspects will come down to how good you are at pressing your luck and reading the other players. Lets start with pressing your luck. The main mechanic in Broom Service The Card Game is determining whether to play your cards “brave” or “coward”. Playing a card coward is playing it safe as you can’t lose anything but your reward is significantly less than if you would have taken a chance. If you always play cowardly you have basically no chance of winning the game. Instead of playing cowardly you can play cards bravely. Playing a card bravely can earn you two additional potions but you could end up getting no potions out of the card if another player also plays their card bravely. Just like you can’t always play cowardly, you need to be cautious playing cards bravely as well. While you can occasionally lose a card, if it happens too often you don’t have a good chance of winning the game. The key to the game is finding the right times to play cards bravely and which times you should play cowardly. This is where you have to be good at reading the other players. Basically the best thing you can do in the game is choose colors that the other players don’t pick. Any color that you pick that none of the other players choose you can end up playing bravely without any risk of losing the card. Unless it changes with more players, there are usually a couple colors that only one player plays each round. Finding those cards really help you in the game. Reading the other players becomes important because there are going to be colors that you want to play but you might be better off not choosing if other players are also going to chose them. Based on how you score points in the game, there are usually two types of colors that you are going to want to play. First you probably will want to play colors that appear on the task cards since scoring the bonus points are important in the game (more on this later). Otherwise you are probably going to want to play colors that you have already collected in other rounds. Since the scoring offers more points for collecting more of the same color potion, in the ideal game you would just choose three colors to collect throughout the game. The problem is that if you do this the other players are going to notice and will likely choose a card of those colors to limit the potions that you are able to collect. This is when it becomes helpful being able to read the other players because it will allow you to change up your strategy to maximize your points. If you can consistently predict what colors the other players are going to play you are going to have a pretty big advantage in the game. To illustrate how important it is reading the other players I want to shortly talk about a mistake our group ended up making when we first played the game. For the first time that we played the game I missed the word “different” in the rules and I will say that word is really important. This might not sound like much but it is a key component of the game to have the players choose three different witches in each round. Giving players the ability to play multiple witches of the same color basically ruins the entire game. Players will just play several witches of the same color. This ruins the game because the game relies on being able to predict what colors the other players are going to choose. If each player just does their own thing the game becomes dull quickly. After reading the other players I think the turn order may play the second biggest role in the outcome of the game. Turn order is so important because it has a huge impact on whether you can play a card brave or not. For example you are taking quite a big risk playing a card brave as the first card in a turn (unless most of the cards have already been played). Meanwhile if you get to play last in a turn you can play a card brave with no risk of losing the card. While you might be able to slightly impact turn order from time to time, it usually comes down to luck. If a player can get turn order to go in their favor quite a bit they are going to have a big advantage in the game as they will be able to play a majority of their cards brave which will score them more points. As far as the task cards I think they are a nice addition but could have been better. What I like about the task cards is that they add competition to the earlier rounds of the game. Due to the bonus points the task cards guide players towards playing certain colored cards. Getting the bonus points can make the difference between winning or losing the game. This is going to be enticing to the players which will lead them towards choosing these colors. This makes the early rounds more interesting as players try to outwit one another to get the most potions in these colors. I have two issues with the task cards through. First off it is not that hard to complete two of the task cards at the same time. As the same color is likely to appear on two of the cards if a player collects enough of that color they might actually be able to take both cards at the same time. I am not a huge fan of this because it will give that player a pretty big advantage in the game just because of the color they chose to play. The other problem that I have with the task cards is that they are gone so quickly. Generally within two or three rounds all of the task cards will be taken. This means that there are no task cards to go after in the final round or two. At this point players will just try to collect more potions of the colors that they have already collected. While I can see not adding new cards after the task cards have been taken, I would be interested in seeing how adding one or two task cards at the beginning of the game would change the game. I think one of Broom Service’s greatest strengths is its simplicity and length. For a game based on a board game that won the Kennerspiel Des Jahres I have to admit that I was surprised by how simple the card game truly is. While it is more complex than a game like UNO, I would say that the game is only slightly more complicated. I think you should be able to explain the game to new players within 3-5 minutes. I could actually see Broom Service The Card Game being a good game to branch players out from games like UNO into more complex card games. The game also plays pretty quickly as I would say that most games should take between 15-30 minutes. Basically I think Broom Service The Card Game is a very solid card game. 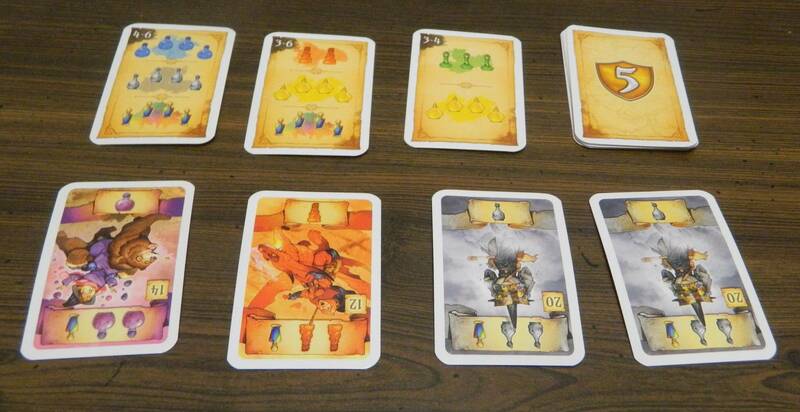 The game is not a highly innovate card game but I had fun playing it. The game is not overly complex as it is simple enough that you can play it without having to put too much thought into any given move. If you like complex card games it won’t be for you but if you are looking for a good filler card game it will serve its purpose. Broom Service The Card Game is not something that I would play all of the time but it is something that I would play every so often. 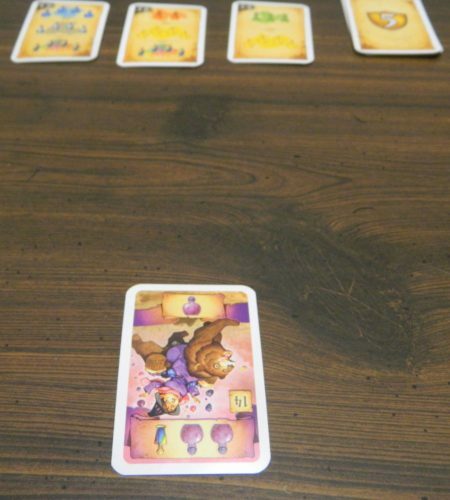 While I enjoyed Broom Service The Card Game it is not a perfect game. The biggest problem that I had with the game is that it just felt like there was something missing from it. I could see the game being improved with some house rules. At times it just feels like not enough happens in the game. I would actually be interested in seeing how the game would play if each player got to choose four or five cards each round. I am curious about this because players are left with a bunch of cards in their hand at the end of the game that they never end up using. Being able to play one or two more cards each round would put a greater emphasis on reading the other players since with only three cards there are too many times where only one player chooses one of the colors. I also think Broom Service The Card Game is a game that would benefit from more players. I ended up playing the game with four players but I think the game may be more enjoyable with six players. The reason that I think the game might be more enjoyable is that since there are more players you will have to read more players. This will put a bigger emphasis on guessing what the other players are going to do since it is more likely that you won’t be able to play a card that none of the other players chose. While the game only includes cards I still think the components in Broom Service The Card Game are pretty good. The game’s artwork in particular is really good. The game’s artist (Vincent Dutrait) deserves credit for their work. The card quality is also pretty good as they are thick enough that if you take decent care of the game you shouldn’t really have any trouble with the cards wearing out prematurely. The only thing that you could maybe complain about with regards to the components is the size of the cards. The game’s cards are smaller than normal playing cards and are similar to the size of cards from the original Ticket to Ride games. While there is nothing you really have to read on the cards, some players would probably prefer that the game included normal sized cards. 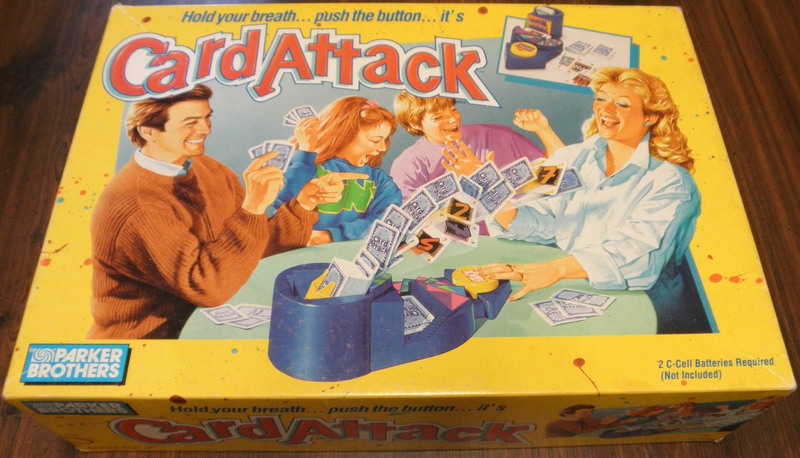 Arguably the best part of the components is that the card game actually includes a mini expansion for the original game. As I have never played the original Broom Service I can’t really comment on how good the mini expansion is. 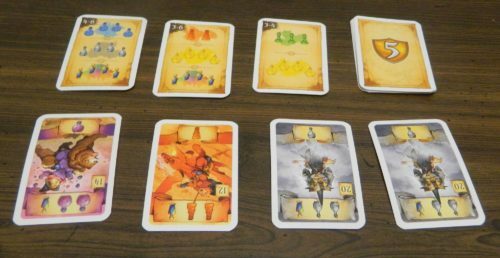 The mini expansion does seem to have generally positive reviews from other players though. I really like the idea of including an expansion with the card game since if the card game doesn’t live up to your expectations, the expansion for the original game should offset some of your disappointment. Should You Buy Broom Service The Card Game? Despite never playing the original Broom Service I would say that Broom Service The Card Game is a solid but unspectacular card game. I have to say that I was a little surprised by how simple the card game truly is. Basically the game comes down to deciding when to press your luck and being able to read the other players. You need to choose the best times to take a risk playing a card brave as you can’t win without taking some risks. You don’t want to take too many risks though as you will lose out on a lot of points. Choosing when to take risks relies on being able to read what cards the other players choose to play each round. While it is usually pretty obvious what cards you want to play, you have to be aware that the other players also know this as well. 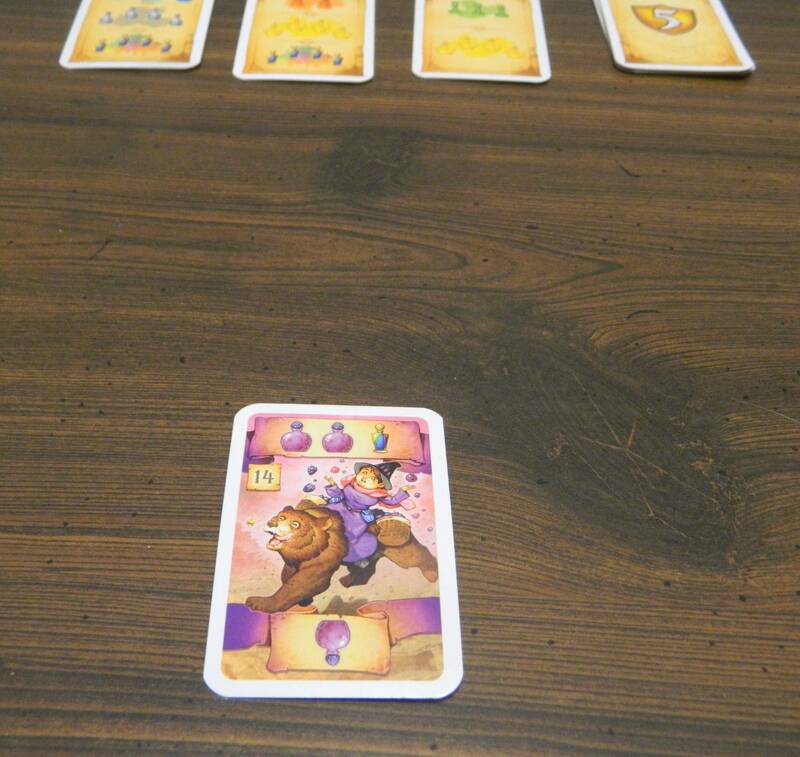 Broom Service The Card Game is a fun game but it doesn’t really do enough to distinguish itself from a lot of other card games. If you don’t really like press your luck/reading the other players card games, Broom Service The Card Game may not be for you. Also if you are looking for something more than a filler card game it might be a little too simplistic for you. 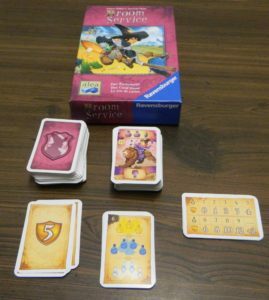 If you are looking for a good filler card game though or enjoyed the original Broom Service game I think it is worth looking into Broom Service The Card Game. A simple card game to teach to new players and works as a good filler due to its length. Has an interesting dynamic between its press your luck and reading the other player mechanics. Is not a highly original idea for a card game. Might be more simple than a lot of players would anticipate.